After the scientific testing has been completed, BrainCare provides graphical reports based on patient test results. The clinical report is easy-to-read and provides the clinician with additional information and research-backed guidance. Repeated test administration on return visits combined with helpful reports and graphs help staff to visualize longitudinal trends. Typically, the clinician is tasked with writing a professional report for the patient to take home. 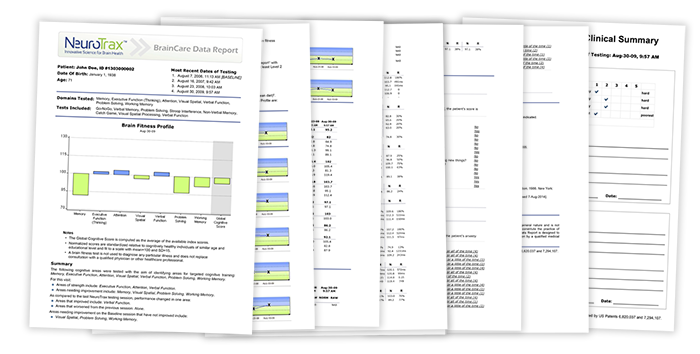 An important BrainCare feature facilitates report-writing by providing the clinician with a Word-editable template that is automatically populated with patient demographics and testing results. 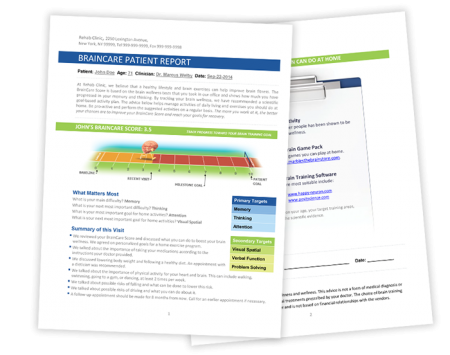 It is a patient-friendly, graphical report that displays an intuitive BrainCare Score, as well as advice in support of the clinician’s recommendations for brain wellness exercises. The Patient Report helps patients to track their progress, a factor that may motivate better participation with their home wellness plan. The recommendations are based on demonstrated patient performance and results from the battery of BrainCare tests. The Patient Report may also include evidence-based recommendations for brain wellness.